I love the movie My Life in Ruins. Even more so since I've just returned from Greece. My sister and I had watched it before our trip and it couldn't just be coincidence that it was one of the many on-demand movies on Turkish Airlines on our flight home. The main character, Georgia, is a tour guide in Greece. She's taking a diverse group of strangers with strong personalities around to see the famous sites. She hopes to share her love of history with them. And as anyone who works in hospitality and tourism knows - it's not all that glamorous. Georgia: "What is it with tourists and ice cream? They had some this morning, then again after lunch. And now again with the $4 cones. I don't get it." I love ice cream on vacation. Walking around with a cone or sitting in the sun with a dish of ice cream is the epitome of what vacation should be. You have the time to relax and indulge in a special treat. You can watch the world go by. You can try new flavors. You can chat with new people about the shared deliciousness. You embrace your vacation mentality that every treat is a new experience. Friends and family who have traveled with me know that I seek out ice cream pretty much every day. Ice cream is accessible almost anywhere that has a snack bar or cafe - which is almost everywhere in the world. Even in non-tourist destinations. 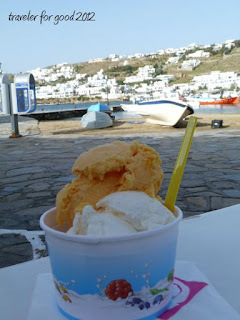 In Greece I alternated between ice cream/gelato and baklava (and all its cousins). Some days I had both. What's your favorite vacation treat?